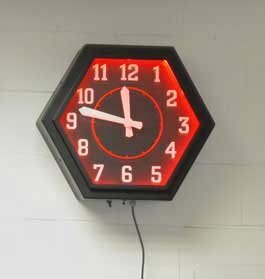 Hexagonal Exterior Neon Clock available for indoor or outdoor use. 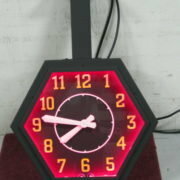 Clock can be surface mounted, or stem mounted, single or double dial. Available in various sizes, finishes, neon color. Available manual set or with 99B-MI Tower Clock Control. Originally designed for the Mimosa Restaurant at the Minneapolis-Saint Paul Airport. Information on the design process available here. Contact factory for additional specifications.